The Valley Zoo Development Society is proud to offer these beautiful, one-of-a-kind, limited edition Red Panda Carry On’s (Size: 21” X 14” X 9”.) 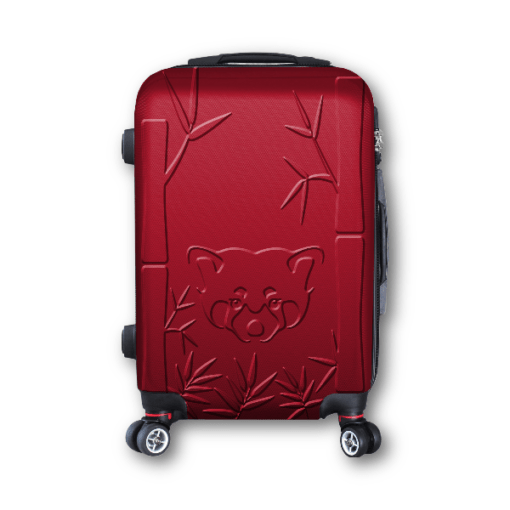 Durable, red coloured, ABS molded outer shell features an embossed red panda and bamboo motif. Four spinner wheel’s, fully-recessed aluminum pullout handle, and two carry handles make airport travel a breeze! Wrap around zipper comes complete with a lock system to keep your belongings safe. The black inner liner is printed with the red EVZ logo, and has a mesh & shoe pocket and crossed clothing travel straps keep your clothing organized.